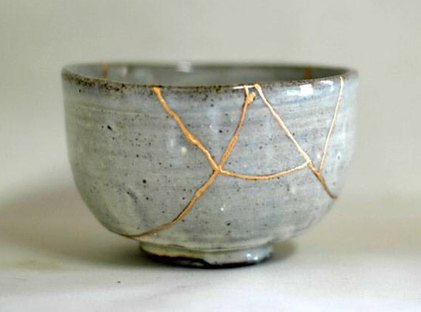 Kintsugi, “to patch with gold”, is the Japanese art of repairing broken pottery with gold lacquer. It is the traditional, Zen-related craft of the “broken and perfect”, of recognizing and bringing out the beauty in broken things. Follow this link for a brief video on the contemporary practice of Kintsugi. More information and resources available following this link, with thanks to Kenetha J. Stanton.